Contemporary abstract painter Jenny Eden showcases a collection of exciting and innovative work. Interested in Abstraction and current painting concerns, Eden has investigated new ideas in painting to produce a body of work that is challenging in content, confident and suggestive. Her recent work uses colour, form, pattern and texture combinations to generate surface tension and evoke a visual stimulation. 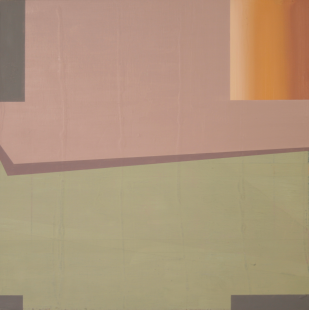 In her latest body of work Eden has experimented with composition to make paintings that imply the �continuation� of a form past the frame. Heightened by a heavily mixed palette, where colours are taken beyond their conventional norm, the forms within her paintings are often awkward or unusual, placed irregularly or towards one side of the frame to suggest the existence of something larger beyond the canvas. Eden�s work involves the process of journeying through the image in order to make sense of it. She is keen to gain a sense of forms advancing and retreating within a painting to indicate movement. As well, the visual result of using solid colour (sometimes to conceal work underneath the surface) creates a break or shift between heavy texture and something much less involved. Together, these elements of her work give the viewer a role in thinking about the purpose of a painting. Jenny Eden currently lives and works in the North of England. She trained in Fine Art at Birmingham School of Art with postgraduate study in Art Psychotherapy.